The city of Troyes, in the Champagne region of France, has long been a cultural center. The cathedral that stands in the city took over 400 years to finish (and you thought it was taking them a long time to do that road construction on your way to work). During all that time, various different families vied for power and prestige. Now you can replay those times as Troyes and Ladies of Troyes are back in production and available from Asmodee. In the Champagne region of France, the grand Troyes Cathedral stands as a remarkable monument to the struggles and triumphs of the city’s inhabitants. With construction beginning in the early 1200s, this architectural and artistic marvel is a testament to the great leaders and stalwart citizens of the city of Troyes. The city and its people survived disasters both natural and man-made, and the work of the Troyes Cathedral took nearly four centuries to complete. At its peak, the city of Troyes was at once a center of artistic expression, a hub of trade, and a beacon religious leadership. 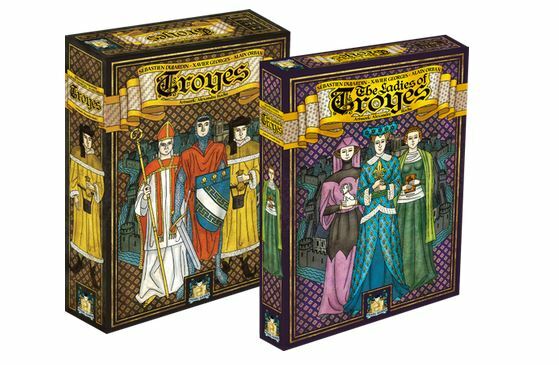 Relive an especially exciting era of this city’s history in the highly acclaimed game of Troyes, designed by Sébastien Dujardin, Xavier Georges, and Alain Orban. Troyes, and its expansion Ladies of Troyes, are back in print and available now! Take on the role of a prominent leader in this bustling medieval city and guide your family to prosperity in a time of upheaval and opportunity.